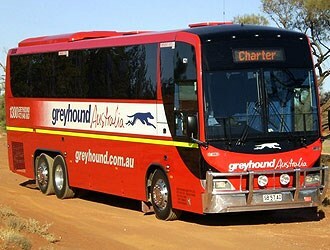 Greyhound’s Broome to Perth and Toowoomba to Melbourne runs will cease on March 8 following an Australia-wide review of company’s long distance coach services. General Manager Sales Kevin Lyons says Greyhound's resources business in the west was continuing to grow rapidly and the Broome to Darwin passenger route remained commercially viable. But Lyons says services along the underperforming Perth to Broome route would cease on March 8. "Western Australia is a very important market for Greyhound and we continue to see rapid growth in a number of areas," he says. "Unfortunately, the Perth to Broome passenger service is not one of them." Lyons says for the past decade, Greyhound had tried to make Perth to Broome route commercially viable by reducing frequency from seven, then five and currently three days a week, as well as offering discounted fares. "New competition on the Perth to Geraldton, Exmouth and Port Hedland routes has meant a further decline in already poor patronage which, combined with high fuel and operational costs, has forced Greyhound to withdraw its services," says Lyons. By mid-February forward bookings on the route had been very low. "Only 54 people had reserved seats for the remainder of the year and, of course, Greyhound will provide full refunds to those booked to travel after March 8," Lyons says. "We empathise with passengers and businesses affected by this decision, but we simply cannot continue to absorb losses on routes with very few passengers." Also affected by the review is the Toowoomba to Melbourne express service which will also cease on March 8. Lyons says the inland route had continued to struggle, despite campaigns to improve the route's efficiency and profitability with targeted marketing, aggressive pricing strategies and direct mail programs to local communities, each of which he says has had limited success. Forward bookings had also been low, and Greyhound will issue refunds to the 16 customers who had booked for travel post-March 8. Lyons says as part of the review process, Greyhound may increase capacity on some other express routes due to their popularity. He says the Toowoomba to Brisbane services will have increased frequency.